The well-known investigative journalism podcast Serial became the fastest podcast to reach 5 million downloads in iTunes history. And it is only one among many examples which show that all you need is a microphone, a host and an ambitious team to create effective and engaging journalism. Through podcasting, journalists can tell their stories in an audience-engaging format and potentially reach a new world of listeners. 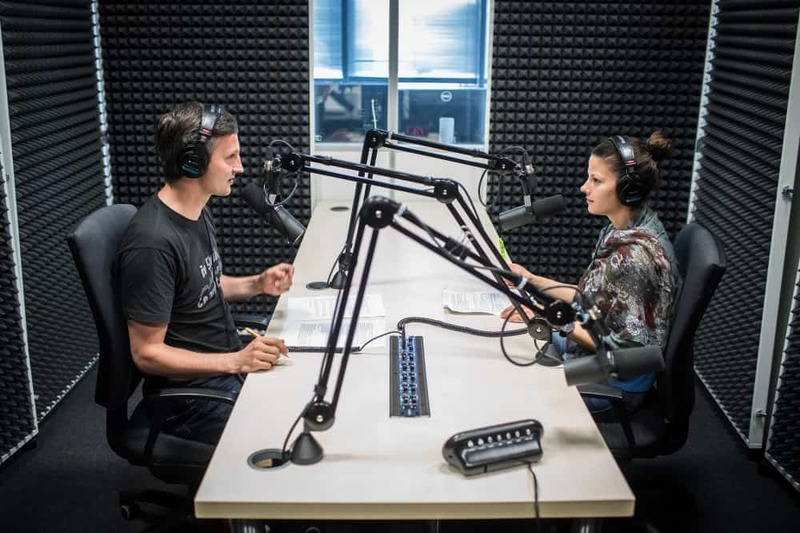 At the same time, many newsrooms in Europe are just now starting to experiment with podcasts and there’s a lot to learn about the ways to produce, promote, distribute and monetise them. So where to start when it comes to using audio as a storytelling medium in your newsroom? And how can you establish and increase your audience? We asked someone who has done it with great success — Dávid Tvrdoň, podcast producer at SME.sk. Previously you’ve written that your team “accidentally started a podcast revolution and hit one million downloads”. Tell us — how did you make it happen? We started by experimenting with a daily news podcast, trying to replicate the success of The Daily and Up First in the US. People loved it so we added more podcasts. There is a catch though — almost no one knew what a podcast is or how you should listen to it. We saw these huge numbers of podcast listenership growing in the US tracked by Edison. But in Europe, especially Central and Eastern Europe, there was no one tracking it, because the listenership was almost non-existent. That is until now. We went from zero to tens of thousands of podcast listeners in just a few months. Of course, we needed first to explain and show how to listen to podcasts. And most of all, we had to have a good reason for our audience to listen — the daily news podcast. What are the main reasons newsrooms should consider doing podcasts? As we at SME.sk see it, a podcast is another distribution platform for our journalism. People read and watch our journalism, but we were missing the sound. People commute to work more and more, also in small countries, and radio used to be the go-to medium source for this. But you don’t tune in a radio station with your smartphone, you stream music on Spotify. And another great alternative is to listen to podcasts. We went from zero to tens of thousands of podcast listeners in just a few months. So, I would say the main reasons are the quick adoption, getting your journalism to young audiences and the fact that podcast listeners are a highly engaged audience. We see a 90% consumption rate on average. Of course, you cannot just take something and transform it into a podcast and expect it to work. What are the secrets to create a successful podcast? We started with conversations. Every podcast we do at the moment (except one) has two or three people talking about a topic, mainly our reporters, sometimes expert guests or even politicians. And, because almost no one from the newsroom has radio training, we sound like friends casually talking to each other. This is accidental, we didn’t really plan for it, but it’s the feedback we constantly get from the audience. People like that we explain the news, go deeper and really take it slowly from the very beginning. Not just with the daily news podcast, but with all our podcasts, this is something we have deliberately decided and keep in mind. What equipment and tools are necessary to create a news podcast? Actually, the entry barrier is very low. You have to have a clear sound and that is about it. A very good go-to option is the Blue Yeti mic. You can cut audio with Audacity software, which is free, and you can buy unlimited hosting on Podbean, Libsyn or SoundCloud for around 100 euros per year. We started recording our daily news podcasts in the corner of our video studio. 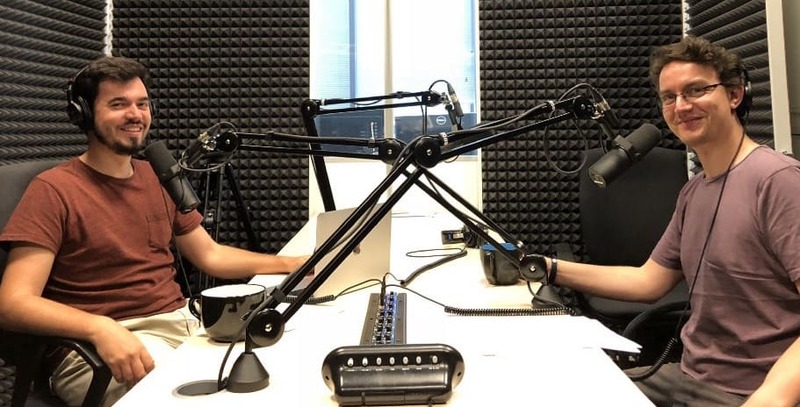 As we built up and generated income by selling ads, we invested in a podcast studio, where six podcasts are being recorded weekly. What are other resources needed? Well, once you have the mics and the place to record the podcast, you need the hosts, the journalists behind the mics. We were lucky, in that we had the buy-in from the newsroom management. The pitch was easy: let’s do this experiment, see how it goes, and if it fails, we shut it down. Because all that was needed were 15 to 20 minutes of a different reporter daily to chat about the article he or she was working on. They basically had to skip one cigarette break and we had a podcast. Also, we turned one of our cameramen into an audio editor and now he has become so excited about podcasting that he does it full time. How can you establish and increase your podcast audience? I wish I had a smart answer for this, but all we do is that we treat podcasts like our articles. There is an audio player embedded within the article and we label it audio. Of course, we made sure our podcasts are everywhere — Apple podcasts, Google podcasts, Spotify, TuneIn, Alexa…you name it. As with any new format, we keep it regular. There are daily news podcasts. You can find the podcast article on the same spot on the homepage (still our biggest traffic driver), and we have weekly spots for weekly podcasts. As podcasts are big among the tech-savvy, we have launched tech and science podcasts too. That’s how you can get to such audiences — with something they like and later you can introduce them to your other podcasts. The secret is, once you get a person hooked on one podcast, it is really easy to sell them on others. I always say podcasts are addictive, in the best way possible. What should journalists keep in mind when using a podcast as a storytelling medium? You have all the time you need — be specific, describe things the best you can, go into detail and don’t speak too quickly. It doesn’t matter if you tell a news story in 12, 22 or 30 minutes. Obviously, there are sweet spots, but overall, if a story needs more time, the listener doesn’t mind. In this regard, I like the 11 commandments of podcasting the BBC has published recently when commissioning podcasts for their Sound app. I like all of them, but in this case, number 4 tells it all: “Podcasts are built for the headphone generation, be respectful, warm and gentle inside their heads.” Such a nice way of putting it, very British, and very true. How do you convince the newsroom of the value that podcasts can add? Good question. Let me tell you what we found out. When our reporters write good stories, they get many comments, mostly negative. But when we produce the story into a podcast as well, they get heartwarming emails. I’m not saying that constructive negative feedback is not valuable, of course, it is. We mess up, correct it, apologise and try harder. Another reason for us was that we are gaining new audiences with podcasts and we started to ask people to support us with buying digital subscriptions for SME.sk. We get emails and mentions on Facebook that they bought a yearly recurring subscription because they like the shows. That really makes a difference, in the eyes of the newsroom management and also among our reporters. You produce a product people love, are thankful for and even keep telling you how to make it better. What are your observations regarding the engagement of the audience that consumes your podcasts? As I said, the average consumption rate is mind-blowing. We never get 90% finish rate on articles or videos. Moreover, readers spend 35 minutes weekly on our website, while with podcasts, it’s minimum twice as much — the most engaged listeners spend even 4 hours weekly. We created a Facebook group, a podcast club when we started doing podcasts and the group has become a big help. People react, comment, give us feedback on specific episodes of the different shows we produce. One thing is to have good analytics, but when you couple it with quality feedback from listeners, that is priceless. What are your three main podcasting tips for journalists? If your newsroom is not doing podcasts, pitch it like an experiment or an innovation project, find allies in terms of colleagues interested in doing a podcast with you and start slowly building your audience. I strongly believe in conversation as a go-to format for podcasting. And would invest a few euros into a half decent mic to have a basic clean sound. How does the future look like for podcasts in journalism? I feel very hopeful about the format. Of course, we need to keep in mind we are still at the “mainstream” beginning of podcasting and there are several countries and even continents where podcasts are not well known. So I see a lot of growth potential. And hopefully, once it will be one of the primary content formats for every newsroom. That would be a very nice future. 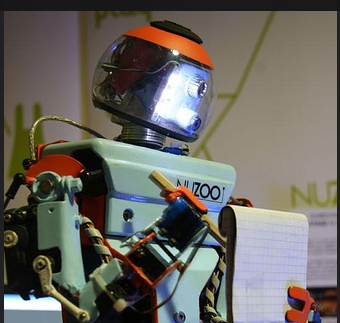 This article first appeared at European Journalism Centre and Medium. It is republished here with the permission of the author.